"These are great with Italian porketta." Bring a large pot of lightly salted water to a boil. 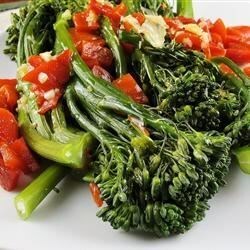 Add the broccoli rabe, and cook uncovered until the stems are tender, about 5 minutes. Drain in a colander. Heat the olive oil in a large skillet over medium heat. Stir in the garlic, and cook until tender, about 1 minute. Add the broccoli rabe. Cook and stir until the broccoli rabe has been cooked to your desired degree of tenderness, about 5 minutes for soft. Stir in the roasted peppers until heated, then remove the skillet from the heat, and stir in the lemon juice. Sprinkle with Parmesan cheese to serve. This easy, delicious vegetable side dish goes with practically anything. Great combo! Loved the tangy lemon juice and the sweet roasted red peppers - they played off each other perfectly! Maybe next time I'll add a little red pepper flake to give it just a kick. I subbed EVOO for Kerrygold grass-fed butter; tasted great. Easy, hassle-free side. Will make again. Very good; rave reviews from my family! Take care NOT to overcook. We're trying it again tonight as a topping on my homemade pizza :) I think will give it a gourmet flare!